Many retailers donate old inventory to charity in exchange for a tax write-off. While it's a common last ditch effort to cut losses on stale products, is it a savvy financial move? Learn more and use our free tool to calculate the impact of this strategy on your business. It's not a sign of failure. Every business makes bad buys at one time or another. Seriously. All of them. What sets you apart is how you handle it. Do you ignore it, or do you act on it, and how? It's not income. When you earn less money, you have fewer taxes to pay. Your charitable donation, like any other loss, is deducted from your gross income and you pay the government less as a result. It's not a tax credit. This is a common misconception. Tax credits are often offered as incentives by the state and federal governments for behavior they want to reward, such as hiring a certain number of employees per year. This tax credit is subtracted from your overall tax bill directly. On the other hand, tax write-offs, or deductions, reduce your taxable income. They are simply a different way of documenting that you've accrued a loss. The business donates $10,000 (at cost) of excess inventory to charity. As a write-off, this amount is deducted from their net revenue, which means they will only be taxed on $90,000 in earnings. Instead of paying $25,000 in taxes, they will pay $22,500. The net savings in this scenario is $2,500. So, we've determined that tax write-offs do make a financial impact. But exactly how helpful are they? Let's dive into another case study to find out. Say there's an old shoe in your warehouse or back room you purchased for $60. The total tax benefit is determined by multiplying the tax rate (X%) by the cost of goods donated ($60). Since you're donating the inventory, you're "selling" it for $0. We've assumed a tax rate of 25% in this case study. Of course, tax rates vary, so you can insert your own in the attached Excel calculator. If you donate the shoe, the IRS will allow you to claim a $15 tax benefit at the end of the tax year. In this scenario, no new revenue is gained. Rather, you have less income to report, and therefore fewer taxes to pay on your smaller gross profit. Also, there's no immediate boost to your bottom line since the tax benefit is not realized until the end of the tax season. Compare the donation example to an alternative: selling that $60 shoe to a liquidator. In this scenario, that same shoe could sell for anywhere between $10 - $40. Note: on average, inventory sells for around 65% of original cost on BoxFox, depending on product category. The cash generated from the sale to a liquidator can immediately be reinvested in new inventory. So, say that $60 shoe (at cost) sells to a typical liquidator for $20. If you use that $20 to buy a product that sells for double (keystone markup), you can turn it into $40. If you reinvest that $40, it turns into $80. When reinvested a third time, your $80 turns into $160. You've now grown the initial $20 into $160 - a gain of $140 gross profit. Try out our inventory reinvestment calculator to see how this compounding return on investment could impact your store. This is exactly how you can turn a loss into new revenue and profit. Not only that: you can also claim the loss on your cost as a tax write-off. If your sale to the liquidator recovers you $20 of the original $60 cost, your additional tax write-off is the $40 loss on Cost of Goods Sold, multiplied by your tax rate (assumed to be 25%), which is $10. When you donate inventory, there is no sale, and therefore no profit. Those goods just disappear. The only financial benefit you realize is a future reduction in your taxable income. 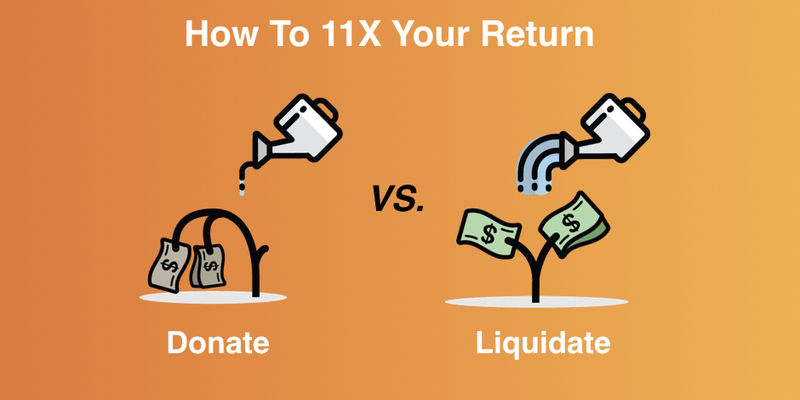 In the above case study, if you sold the old shoe at a loss to a liquidator, it would make a $170 improvement in your bottom line: 11x the value of just donating the shoe. This includes the $140 reinvestment gross profit, $20 liquidation sale and the $10 tax write-off. We've established that tax write-offs do serve a purpose. You may have inventory that won't sell at any cost, even to liquidators. Donate those products and get a tax write-off. It works as a defensive move, a truly last resort. But, if you have merchandise that will sell, even at a loss---do that. It's clearly the winning financial scenario. It puts cash in your pocket, which can be invested in new inventory that turns multiple times, ultimately putting you back on the offensive financially.